Amy Barlowe's original composition Come Close the Curtains of Your Eyes for violin and piano is now available. Ms. Barlowe, a graduate of the Juilliard School and the recipient of numerous awards, is an accomplished violinist and composer whose critically acclaimed solo recitals and chamber music performances have taken her from the major concert halls of New York City to venues throughout all of North America. She brings her extensive experience to Ovation Press with expertly-edited editions and original compositions. Exploring the liaison between poetry and music, through the bond between violin and voice, promotes the kind of artistry that communicates with the deepest possible meaning. Come Close the Curtains of your Eyes, A Poem for Violin and Piano, is a lullaby based on a poem by Pauline Avery Crawford (1890-1952), a fascinating and courageous American expatriate, known for her witty documentation of the effects of World War II on Parisian life. This poignant piece, filled with imaginative word painting, shows another side of this extraordinary woman, revealing that love gave her the strength to triumph over the adversities that haunted her. 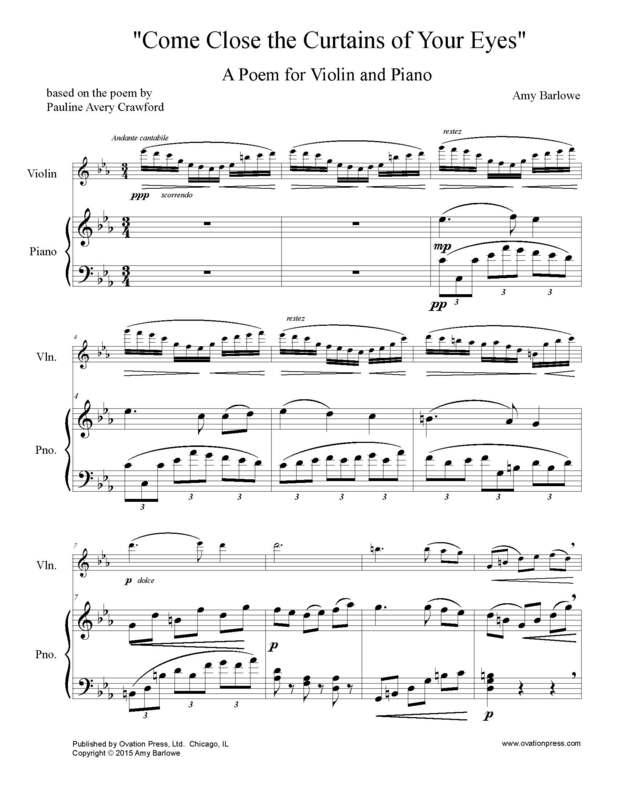 Download and print the score today to gain access to this original composition Come Close the Curtains of Your Eyes for violin solo and piano by Amy Barlowe!